1. Introduction. 2. Surface Science Methods. Dynamical Methods. Static Methods. 3. Experimental Approach. 4. Interaction of Atomic Adsorbates, Acting as Promoters or Poisons, with Single Crystal Surfaces. Electropositive Additives: Alkali Metals. Electronegative Additives. 5. Adsorption of Gases on Surfaces Modified by Electronegative Additives. Carbon Monoxide. Nitric Oxide. Nitrogen and Oxygen. Hydrogen. Water. Organic Compounds. 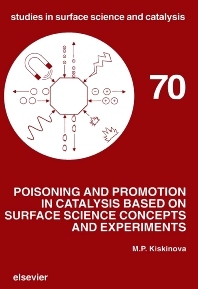 Conclusive Remarks: The Poisoning Effect Described within the Framework of the Possible Interactions in the Coadsorbed Layer. 6. Adsorption of Gases on Surfaces Modified by Alkali Metals. Carbon Monoxide. Carbon Dioxide. Nitric Oxide. Oxygen. Water. Hydrogen. Nitrogen. Organic Compounds. Ammonia. Alkali Modification Effects and Factors Determining the Type of the Interactions in the Mixed Layers. 7. Theoretical Approaches to the Description of the Modifier Effects. Promoting Effect of Alkali Metal Additives. Theoretical Models for the Poisoning Effect of the Electronegative Additives. 8. Model Studies of Surface Reactions on Modified Surfaces. Methanation and Fischer-Tropsch Syntheses. CO Oxidation: Effect of Electronegative Additives. Reaction of NO and CO: Effect of S. Water-Gas Shift Reaction. Ammonia Synthesis: K Promotion Effect. Chemical State of the Alkali Additives under the Reaction Conditions. Conclusive Remarks: Correlations between the Adsorptive and the Catalytic Activity and Selectivity. Index. The topics covered in this book include a variety of adsorption and model reaction studies on clean and modified single crystal metal surfaces obtained by means of properly selected surface sensitive techniques. The accent is on the revelation of the physics and chemistry involved in the effects of various modifiers on the adsorptive and reactivity properties of the surface with respect to different reactants. In this book current information that contributes to the fundamental understanding of the effect of additives is summarized. Some of the additives act as promoters, others as poisons, in a number of important catalytic reactions. A description of single- and double-component systems has been obtained by using surface-sensitive techniques, particularly suited for this purpose. For the benefit of the reader, a short summary of the main surface science techniques has been given in Chapter 2. Three general and interrelated topics are reviewed. The first concerns the interaction of electronegative (Cl, S, Se, C, N, O, P) and electropositive (alkali metals) atoms with metal surfaces (Chapter 4). The second topic covers the chemisorptive properties of metal surfaces modified by varying amounts of additives with respect to different reactants (CO, NO, N2, O2, H2, CO2, NH3, H2O and hydrocarbons) (Chapters 5 and 6). In particular the adsorption kinetics and energetics, and the electronic, structural and reactive properties of the coadsorbate systems are considered, whereby particular attention is given to recent surface science studies with well-characterized, single crystal, metal surfaces. In these chapters, special attention is paid to showing the contribution of different factors (the nature and adsorption state of the modifier and the coadsorbed molecule, the structure of the adsorbed layer, the type of interactions in the mixed overlayers, etc.) to the modifier effects. In the discussion of the third topic, model studies of several important catalytic reactions (Fischer-Tropsch synthesis, ammonia synthesis, CO oxidation, water-gas shift synthesis) on modified metal surfaces (Chapter 8) are considered. The book will be particularly useful to scientists who are interested in adsorption phenomena, surface properties and catalysis. It should also prove invaluable to those addressing the questions of condensed matter (surfaces and interfaces), materials science (e.g. corrosion of metals) and electrochemistry.